My dad was in WWII, he was a chief line mechanic for Project 19 – Africa working on the Curtiss P-40 Tomahawk, made famous for the “shark mouth” logo. 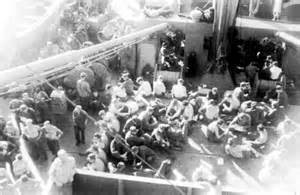 While he was transiting the Atlantic in early 1941 on a large troop transport ship they were limited to about 1-pint of non-drinking water a day for personal use. There were no showers available for them since water was so hard to produce for that many people. So he would get his metal cup, have his daily water ration given to him, and then the fun began. First, he would brush his teeth; he would not spit the water into a drain, it went back into the cup. Then he would dampen a wash cloth and wipe down personal vital parts. Then he would shave. Only then was the water was disposed of. So water has a vital role other than drinking and it can be in very short supply. And now I will share my #1 rule about Filtration & Purification…all water that touches you needs to be filtered and purified. Yup, all of it. Why? Look, you filter and purify the water that you will drink…great! But then you brush your teeth in non-purified water? You can easily introduce a long list of bacteria and viruses into your mouth using non-potable water for brushing your teeth. So now think about washing your hands, face or cooking with non-potable water. Bingo!! All water that touches you in any form must be filtered and/or purified. So what about stored water, does it need filtered and purified as well? Come on, what do you think? What has happened to it since it was placed into the container for storage? What about the container to begin with? What was the water like when you put it in there? So yes, my rule applies to every drop of water in storage. The possible exception would be commercially bottled water. So let’s move on to the topic at hand, water storage. This is water that comes from your homes spigot that is produced a private or public community water supplier. 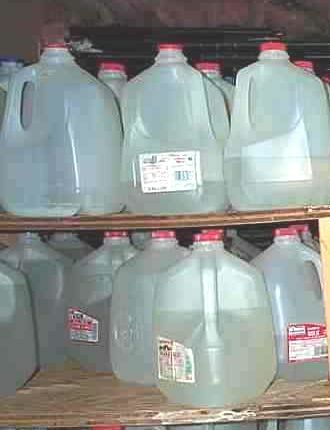 In your house right now you probably already store 50 gallons of water. Yup!! FIFTY gallons of water storage already. 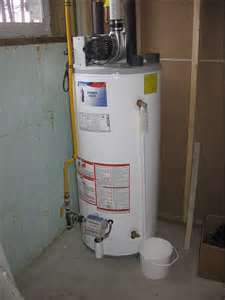 Turn off the electric or gas to your hot water tank. This prevents burning up your water tank as you draw down the water in the tank. Turn off the value to the street water supply. This prevents water being sucked out of your house and back into the water system. Turn off the valve on top of the water heater that goes to the lines in the house. This prevents someone from inadvertently opening a hot water faucet and draining precious water from your supply. Turn off the value under your toilet tank and duct tape the toilet seat closed. Yeah, you don’t want to waste that precious water by someone accidentally flushing the toilet. So let’s hit on a subset of Utility Water for a minute. If you would have any amount of warning that a disaster or emergency is coming fill every possible container in the house that might be able to hold water. Yup, anything; and I mean anything. Go for easy and quantity first such as the bath tub and sinks. Then go for buckets, bowls, bottles, jugs, jars, glasses; literally anything including heavy duty trash bags. One of the items that we have in our home and love it to pieces is a WaterBOB. It can hold up to 100gals and easily fits in your bathtub. It seals up very nicely and comes with a pump to move the water from the container to your bucket, bottle, etc. A WaterBOB is basically a large very heavy duty food-grade plastic sealable plastic bag. It takes about 20 minutes to fill it from your bathtub’s spigot. This is a great way to store water at the last minute for an emergency. So why not use it for storage sooner? It’s great for that! All the WaterBOB needs is some kind of “form” or cage around it to hold in place. But remember, there is a whole of weight involved; about 90 pounds for a full WaterBOB. Plus you have the pressure pushing out on the sides as well. Whatever you would decide to build to house your WaterBob make sure it is sturdy. A smaller similar produce is an AquaPod. They only holds about 65 gallons but is a quality product as well and as a bonus is made in the USA. 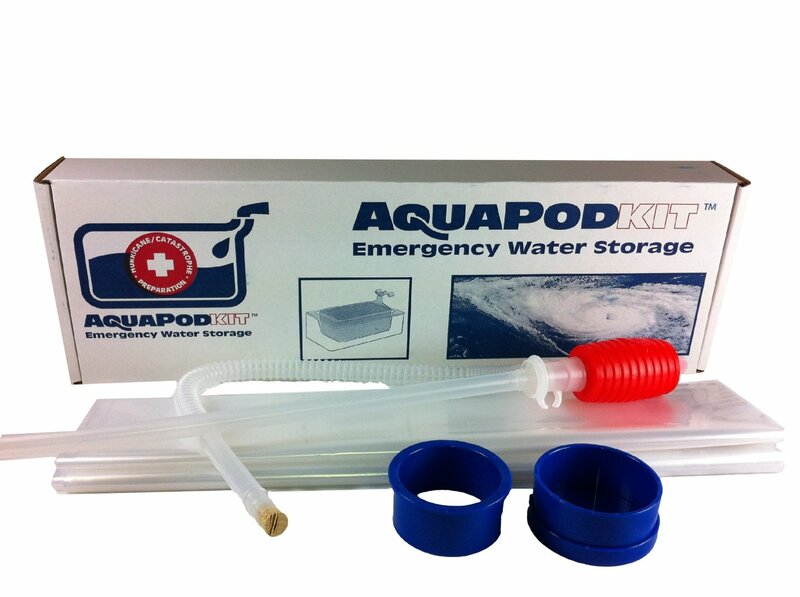 AquaPod & WaterBOB are both readily available on Amazon. A WaterBOB sells for about $40 or so, shop around. An AquaPod sells for about $28 but that is for a 3-pack! 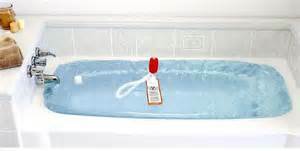 So here is your decision point…If you are going to use it for a last-minute-fill-it-up container and only have one bathtub then I would use a WaterBOB because you can get more in a single container. However, if you have multiple tubs last-minute-fill-it-up containers or you can make good quality forms for them (longer-term storage), then I would go with the AquaPod. Either way, you are storing a whole lot of water. You can buy a case of water (40 ½ liter bottles) for less than $4.00. Each case of water would then last about 5 – 6 days for the average person. Option, buy and store 1 case of water person for each 5 days of supply you want to maintain. Bottled water is easy to store, easy to move, avoids cross contamination among people, easy to track usage (drink 1 bottle of water every 2 waking hours). Note: Bottled water may not be any more pure or safe to drink than tap water under normal daily circumstances. Virtually all tap water in the United States is safe to drink without additional purification. Small size storage containers. I am torn with this option really. For storing and moving smaller amounts of water I see cases of bottled water being the right/best all-around option. But there is a place for small container water storage. I would highly recommend a sturdy food-grade plastic container. I am partial to square containers to save space. But they need to be sturdy enough to handle not just storage, but moving and transporting them as well. The 5gal containers are about the right size in my option. Medium size storage containers. 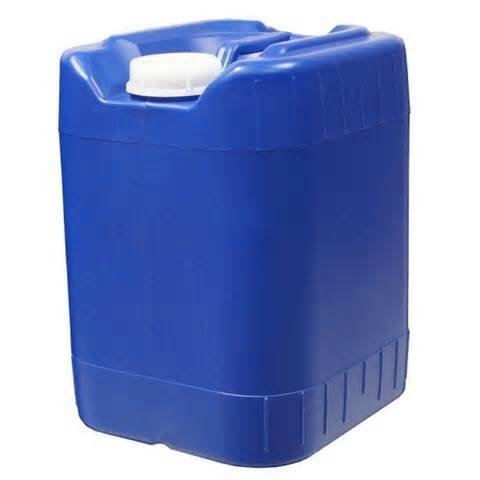 A great compromise for storing water in quantity, but not as intrusive as a large tank in your yard, is a 30 or 50 gallon food-grade plastic storage container. If you have storage space limitations consider decorating them as furniture and putting them out of the way in the yard, on patios, etc.. 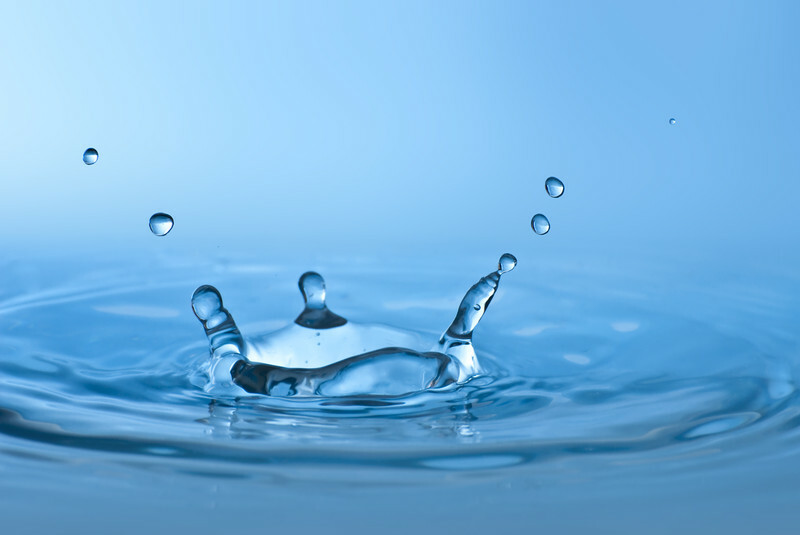 When initially storing your water add bleach to keep bacteria in check (8 drops per gallon). Regardless of the bleach treatment I would always filter and purify water that has been stored like this prior to using it. Note: Use only food-grade plastic containers that you know what was in them prior to you acquiring them. Larger (30-gal containers) that we have decorated is one of my favorite ways to store water! I will do a post showing a project my wife and I did with 30-gal blue barrels and how we turned them into furniture for our deck. Large storage tanks. This option can be a real lifesaver if you have the room for it. 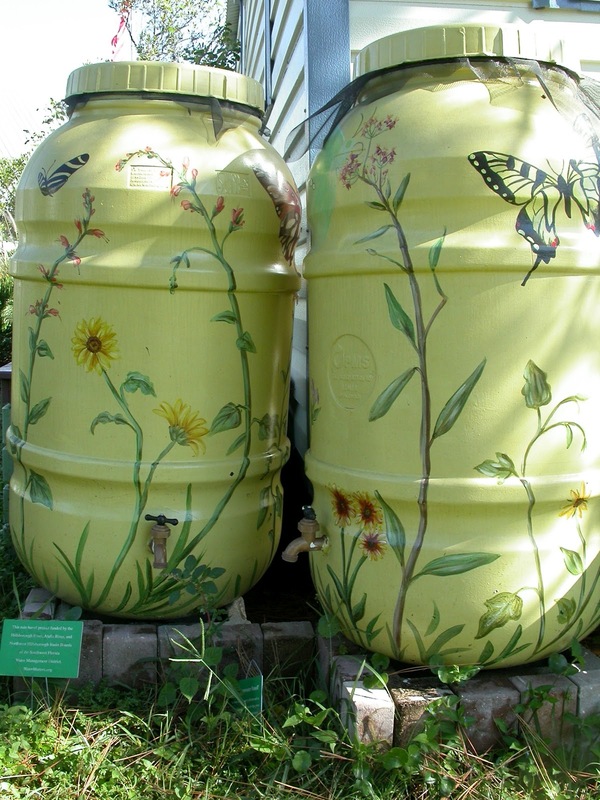 To have a 300+ gallon storage tank full of water can be a really huge benefit. But the same information applies to this as it does to the option of storing water in plastic soda bottles or glass containers, just on a larger scale. 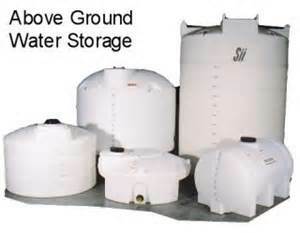 Moving water from large storage tanks is all but impossible unless you move the water to smaller storage containers or have it plumbed into your home directly. Storing the water outside brings additional concerns; preventing freezing, concealing its presence, etc. Note: You know the large, really pretty above round storage tank that you have in the back yard or behind the barn, or the one you were thinking about putting in? Think how nice of a target that makes for folks doing some shooting practice, or drawing folks to you who are looking for water. Consider this storage option carefully. Think about a creative paint job that helps it blend in to the surroundings. Or you might want to ponder making this method an “in ground” possibility. 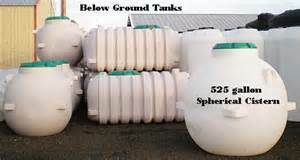 Note of caution: For storing water in these large volume containers consider the location of the storage tank itself. If you place the tank too far away, you have to be able to actually get the water to your house. If bad weather or bad guys are present it might be a little tough to do. Make sure you have a reliable way to get the water to you house under less than ideal/desirable conditions. What plastic containers are safe to use to store water? WARNING: #1 PETE (polyethylene terephthalate) normally used for water, soda, and juice bottles are not designed for reuse. They are not suitable for storage due to the possibility of bacterial buildup. There are also different reports outlining the possibility of BPA leaching over time out of the plastic and into the bottle contents. 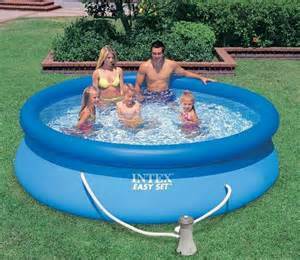 Cool Thought: A small 8′ x 30″ frameless pool from Intex costs less than $66 for about 650 gals of water. Plus you can cool off during hot afternoons!! a 10’x 30″ gives you 1,000 of water for under $72.